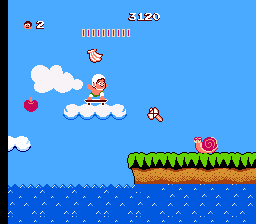 NES Hudson's Adventure Island (JPN) in 37:01.37 by nesrocks. In the South Pacific, Master Higgins lives peacefully wearing only a grass skirt and a cap. That is, until the Evil Witch Doctor decides to capture Princess Leilani and hold her as his own. Now Higgins must rise to the task of saving her! This is a run made from a fan to other fans. It won't be impressive for people who haven't tried playing it seriously. But for people who know the game well, it's quite an amusing watch. The most obvious way to save time in this game is to pick up as little fruit as possible and be close to dying from starvation when the level ends so the score-countdown will take less time.